Cultivators who decide to purchase Atomik Seeds can be sure that their future harvests will have the best possible genetic foundations, providing vigour, quality and large doses of potency to their indoor and outdoor cultivations. Our background in the harvesting, breeding and improvement of exceptional varieties of cannabis dates back to over 10 years ago. This experience enables us to create feminized seeds for cultivators looking for guaranteed quality. Our attention to detail and our careful monitoring of the storage and packaging conditions guarantee a 100% success rate in the germination of marijuana seeds. Atomik Seeds is the result of over ten years of work, during which we have had the support of genetics and cultivators from around the world. Thanks to this cultural and botanical diversity, we have been able to obtain the results that we are presenting to you. We are truly proud of them and commited to give you the best value, price and results. Those who try our feminized cannabis seeds will surely place a repeat order very soon. 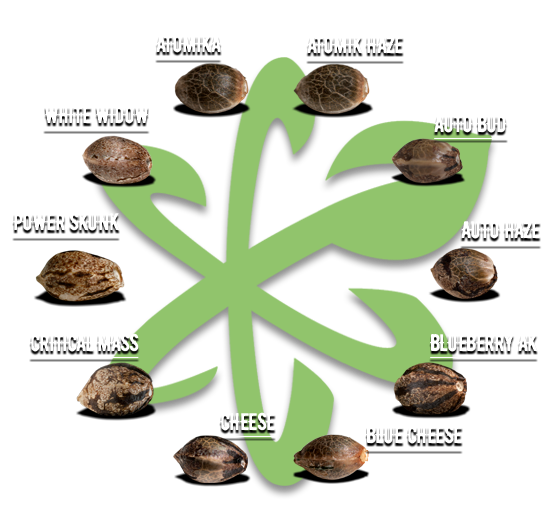 All Atomik Seeds’ varieties are carefully worked on, and are pleasing to the palate. In addition, they are easy to cultivate and are very productive, ideal for beginner cultivators or experts who seek large yields of excellent quality. After the selection process, crossbreeding and the stabilisation of several varieties of cannabis, we managed to develop high-quality feminised seeds. With tastes and aromas that would make you enjoy all the more.